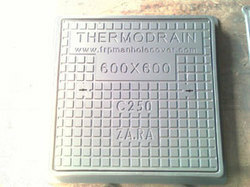 FRP Manhole Covers are made using thermoset material for long term durability. The material comprises of cross-linked polyesters combined with Fibreglass reinforced materials to sustain against wear-n-tear for heavy load vehicular traffic. It is 40% lighter than traditional Precast Concrete and Cast Iron covers. Looking for FRP Covers ?